WILMINGTON, Del. 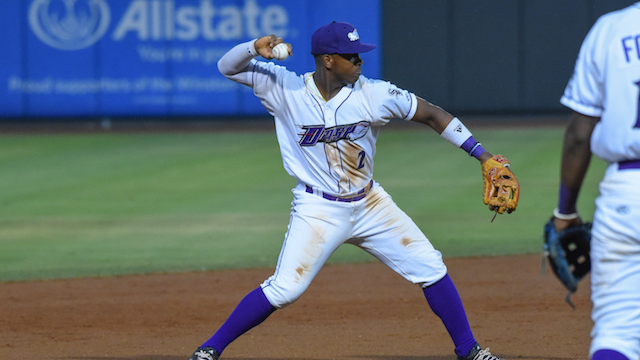 (April 9, 2019) - Winston-Salem turned its first triple play in the Dash era (2009-present) on Tuesday night against Wilmington, but the Dash fell 2-1 in 10 innings against the Blue Rocks in the middle match of a three-game set at Frawley Stadium. With runners on first and second and nobody out against Dash starter Cristian Castillo in a scoreless game in the bottom of the second, Sebastian Rivero bounced a soft grounder to third. On the play, third baseman Yeyson Yrizarri stepped on third, threw to Johan Cruz at second base for the second out, and Cruz fired to first baseman Jameson Fisher for the final out. It was the first triple play for the Winston-Salem (3-3) franchise since June 28, 1999, when the Warthogs turned a triple play against Frederick. But, with the game tied at one in the 10th inning, Nick Pratto stroked a walk-off single into right-center against Will Kincanon (0-1) to propel the Blue Rocks (4-2) to their fourth straight win. Winston-Salem has now dropped three straight after winning their first three games. For the fifth consecutive contest, the Dash plated the game's first run. In the fourth, Craig Dedelow, who has now reached base in all six games this season, stroked a single to right with one out against Wilmington right-hander Nolan Watson. Yrizarri followed by bouncing a groundball to Blue Rocks third baseman Angelo Castellano. On the play, Castellano threw wide of second, allowing Yrizarri to reach base and Dedelow to scot to the third. Then, with Carlos Perez batting, Yrizarri stole second, and the catcher Rivero's throw to second sailed into center field, allowing Dedelow to score. But, in the bottom of the fourth, Wilmington quickly tied the game. Kyle Isbel started the frame with a double to left, and, following a groundout by MJ Melendez, Seuly Matias stroked a sacrifice fly to center to knot the contest at one. Castillo, who was acquired by the White Sox in a trade with the Kansas City Royals in late March, tossed five strong innings against his former team, allowing one run and one hit while walking three and striking out five. Codi Heuer relieved Castillo and recorded two perfect innings, while Alec Hansen tossed a hitless bottom of the eighth. Kincanon followed with a scoreless frame in the ninth before the Blue Rocks pulled out the victory in the next frame. Holden Capps (1-0) recorded two scoreless to earn the win for Wilmington. Winston-Salem wraps up its three-game set against the Blue Rocks on Wednesday. The Dash will send right-hander Zach Lewis (1-0, 0.00 ERA) to the hill against Wilmington left-hander Daniel Lynch (0-1, 12.00 ERA). First pitch is set for 10:35 a.m., and fans can catch all of the action on wsdash.com/broadcast and the TuneIn Radio App. Pregame coverage begins at 10:20 a.m.